ious infestation, the fungus and rot associated with the honeydew can kill an entire crop in a matter of weeks. In addition, whitefly can pose a great threat to plant health because they are able to transmit many plant viruses. A whitefly looks like a small white moth, 1/8" in length. They rest on plant leaves and will quickly fly away when disturbed. Whitefly lie their eggs on the under side of a leaf. 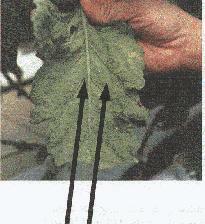 Shiny, sticky leaves are signs of whitefly presence. honeydew and the body fluids of whitefly larvae.